Nose to Fail! Tacos de Trompa AKA Pork Snout Tacos. Roast To Go @ Grand Central Market. Downtown Los Angeles. Snot the best taco in town. Dreams. We all have them. Some aim high and aspire to be the next Nobel Prize, Oscar or Tour de France winner. Maybe start up the next Facebook. Be the next Bieber. Visit all 50 states in the U.S. before turning 50. Eat the entire Jitlada menu. If you're Chastity Bono, become a man. Whatever. Everyone should have at least one. A dream! Something to live for! Something to give purpose to life. Mine. It's to eat every conceivable animal part that you can fit between a fresh tortilla. I know. It's not much of a dream, but it's my dream. To date, I've managed to masticate tacos filled with tongue, throat, head meat, brains, intestines, stomach lining, eye balls, lips and all the other less bizarre protein choices and preparations available at taquerias. 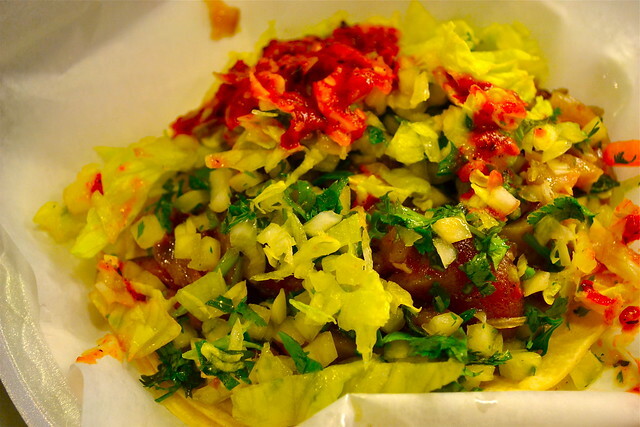 Strangely, nose tacos have eluded my nose for a long time. I've sniffed menu boards at taquerias all around town, in other cities and states, even parts of Baja California for a while, but with no payoff. Maybe I needed a nasal decongestant to clear my sinuses. Then one lazy Sunday, while touring Downtown L.A.'s Grand Central Market, I came across a taco stand with a menu board full of meat choices that beckoned to me like food court harlots. The tempting selections were all familiar and inviting, but I was seeking strange meat, the kind I've never tasted. 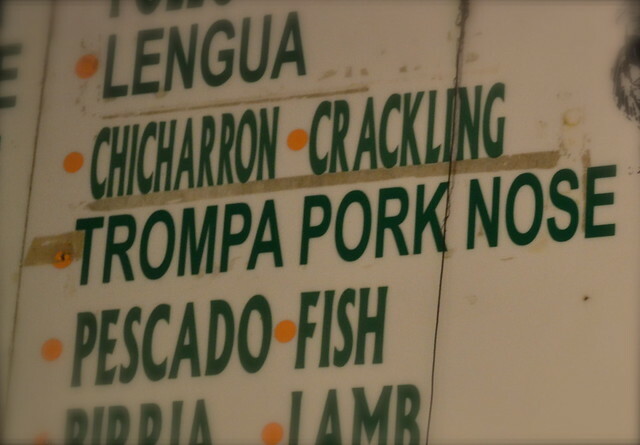 Suddenly, as if a giant magic highlighter floated up to the menu board and directed my attention to the word "trompa", I spied with my little eye the nose I've been searching for all this time. Cooked al vapor style, the pan of pork proboscis appeared tender, gelatinous and moist (hopefully not from a runny nose). At first glance, they looked appetizing, and it wasn't exactly obvious that the chunks of flesh were snouts. On the menu, trompa was actually offered as a burrito, but, a burrito, especially a booger burrito, was much too much food for me at the moment, so I requested a taco instead. I grabbed extra napkins to keep my nose, as well as the ones in the taco, clean. What happens when you're too nosy. On the plate, the taco looked just as delicious as any other offal taco I've ever eaten. 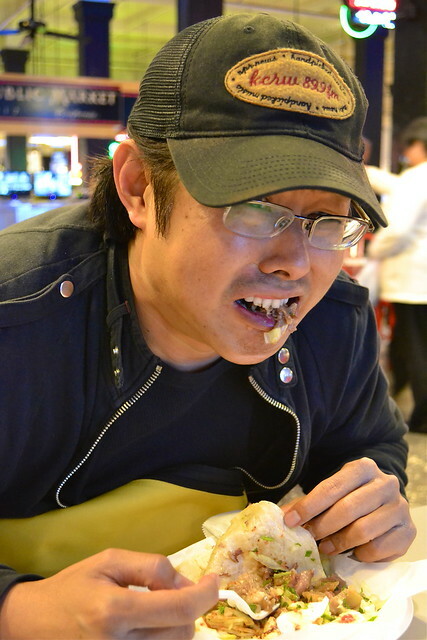 I anticipated that it'd be sort of a cross between buche (throat) and pig ears, you know, a little bit of cartilage, fat, soft tissue and well-spiced phlegm — nothing I couldn't handle, and maybe something I'd even enjoy. To my chagrin, this particular food trip south of the border headed south quickly. I took an instant dislike to the sharp gamey flavor of the snout. The gaminess wasn't the typical taste one would associate with something like goat or wild boar. It was something deeper, more sinister, like well-marinated expellant. The texture was the other unpleasant issue. With each hesitant bite, I envisioned a string of sticky snot adhering itself to my teeth and tongue, permeating my taste buds with every chomp. This further spread that singular gamey flavor. The gumminess of the snout was like nothing I've ever experienced. 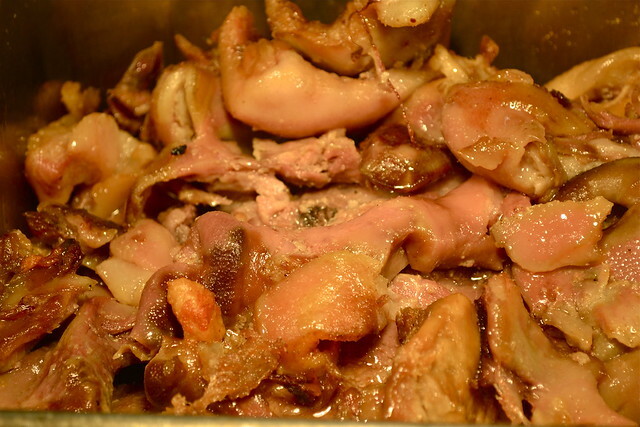 I've consumed plenty of gelatinous foods from beef tendon to trotters and it's one of my favorite mouthfeel sensations. I enjoy slippery, slimy, gooey. I fly that foodie freak flag high, but this was some other kind of freaky entirely. Soylent Green is pig snout!!! Sticky as natto and gamier than an inside of a tauntaun, I couldn't bring myself to take another nibble. The nastiness was exacerbated by the onions and hot sauce, basically adding fuel to the fire. In fact, I had to eject! Eject!! 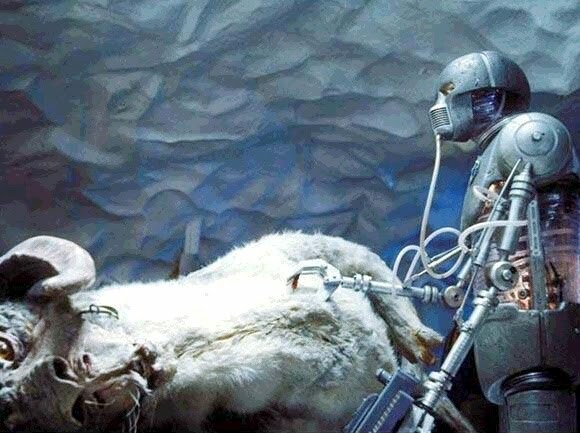 With the help of an extra large horchata, I finally rid the taste of nose off my tongue. Mother always told me never to stick my nose into other people's affairs, but she never warned me about sticking pork nose into my corn tortilla. Consider this a warning, dear Deepling. Now you nose better. You have a nose for good advice. I'm not gonna lie, I snorted soda out my noseholes while reading this. The expression on your face in the photos - hahahahahahhahaha, omg! Glad u can laugh about it. Maybe one day I will. If I can get that taste of pig snot out of my mouth. Every time my Filipno family barbequed, along with hamburgers, hot dogs, and steak, there was pig snout on the menu. But it was more the side (cheek?) and not really the actual nostrils - well, you couldn't see them, anyway. When char-broiled, the snouts would get chewy and crunchy - not really gelatinous at all. I wouldn't call them a favorite, but not particularly nasty. I'm going to blame the Al Vapor technique (or maybe just bad pork) as the culprit. Thnx for the comment. I think you're right about the al vapor technique making matters worse. 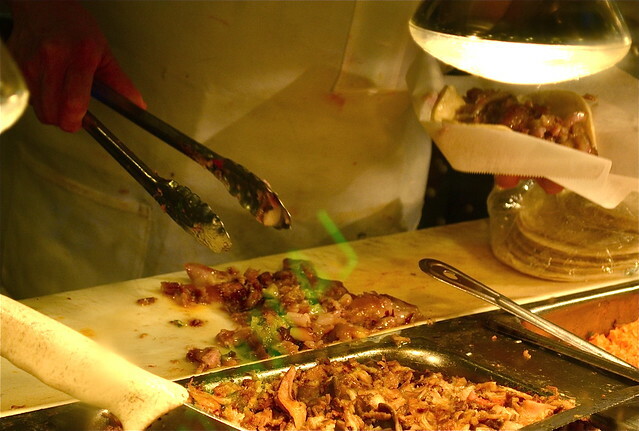 Speaking of snout, cheek and other odd parts a la Filipino food, where can I get some real sisig in LA?? Everywhere I go tells me that have great, authentic sisig...then, pause, but we use pork belly instead of the face meat, etc. As far as my experience, that's not the traditional version. Am I accurate? If so, where can I get the good stuff? Thnx in advance! I don't really eat a lot of non-home-cooked Filipino food. When I'm in the mood for a quick turo turo lunch, I go to Arko Foods in Glendale, but I haven't tried their sisig. There used to be a place in Silverlake/Hollywood I used to go to, but it's since closed. Sorry! ps I spoke to my Mom yesterday and she assured me the BBQ snouts we had growing up DID have the nostril part. Oh well.